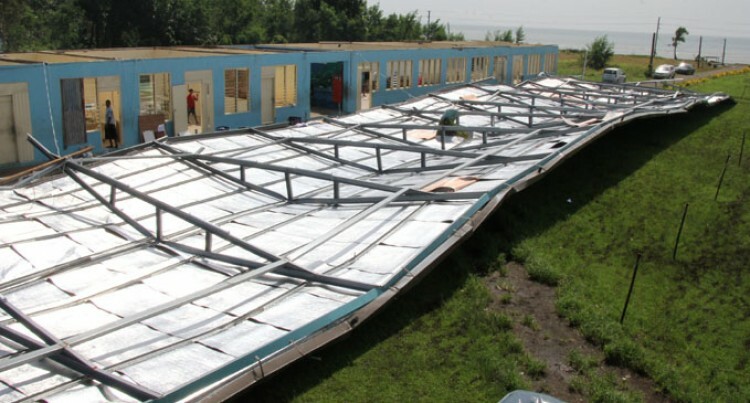 Nine schools in the Western Division were partially damaged and 10 in the Eastern Division were structurally damaged. Nineteen schools in Fiji sustained damage at the height of Tropical Cyclone Gita, TC Josie and TC Keni this year. Acting Prime Minister Aiyaz Sayed-Khaiyum confirmed this while responding to a question raised by Government MP Alvick Maharaj who asked how many schools were damaged by these natural disasters. Mr Sayed-Khaiyum said of these 19 schools, nine schools in the Western Division were partially damaged and 10 in the Eastern Di­vision were structurally damaged. “Ninteen schools were either partially damaged or destroyed in the wake of TC Gita, Josie and TC Keni. He said the work would be con­ducted by the construction imple­mentation unit. Mr Sayed-Khai­yum said apart from this, staff quarters in the Western Division were also damaged. Opposition SODELPA MP Niko Nawaikula asked Mr Sayed-Khai­yum if he could assure the House that upon repair the schools would be structurally safe and cyclone proof and not like Saint John’s College in Cawaci, Ovalau. Mr Sayed-Khaiyum responded that he didn’t want to highlight Saint John’s College, but under­stood that that the MP would try and score political points. “Saint John’s College rebuild was done by the United States Navy. There were couple of schools built through international effort, for example the Indonesians in Queen Victoria School (QVS), but those built by Government have been built to standard.” he said. “Other structures in the past were also built by local contractors and not up-to standard. MP Aseri Radrodoro asked Mr Sayed-Khaiyum that out of the 19 schools how many were repaired after TC Winston and now dam­aged like Saint John’s College? Mr Sayed Khaiyum said he didn’t have the response to the question and it was no time for cheap politi­cal points. He said they needed to under­stand the emotional strain that were upon the people when the cy­clones affected them and when the schools were damaged. Mr Sayed-Khaiyum once again invited Opposition MPs to the situ­ation room in Government where all the charts and timeframes were being displayed. There they will see which schools were constructed and the time frames given for those affected by TC Winston to the recent cyclone.